Here is William as we visited the various houses that are on the site. It was very interesting to look at all the history that the Lighthouse had to offer. The kids loved running up and down the brick pathways. Doesn't William have the funniest look on his face..."which way do I go?" that he took yesterday while the shuttle was going up. I sadly didn't hear it because I was tucked away in the library teaching mommies how to breastfeed their babies. But I was looking at this picture later that he took...still in awe of what man has created so many years ago. 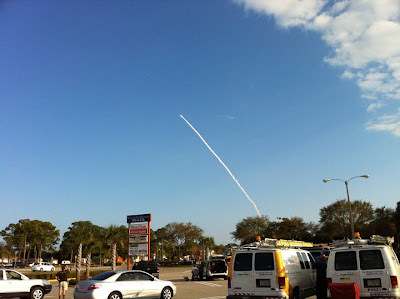 When you live where I live in Florida you get used to the shuttle going up...but it is still one of those amazing things. But then I was quickly reminded that my God, our God, the only God is so much more powerful than this amazing spacecraft. He is faster, stronger and wiser than this wonderful machine. So, if you are in a place in life of indecision...or change...or uncertainty...look up and and see the most high God. He is there for you! And for me. He is amazing, powerful, swift and the wisest of all. Ponder that for the day. Have a great Friday! My body is up way too early this morning. It was only a bit after five this morning that my internal alarm clock went off. I can't stop it. I can't unplug it. It's just there. And it's been there my whole life, insisting that I get up at unusually early hours. Of course the sweet part of this deal is that this is the only time that my house will be quiet until late tonight. I treasure this time. I love it. I covet it. So, what's on the agenda for today? Everything! I can't even go over it because it will start to overwhelm me. I was loosely going through it in my mind early this morning and it brought a moment of "how will I ever get it all done?" Of course I do. I am just ghastly tired by the end of the night. My days go by so fast. And not only am I thinking of today, but I am thinking of the next week, month and sometimes year. Trying to focus on the now...trying to at least. Caleb and William...loved hanging out with their friends and getting so many Valentine cards! Esther and William stop for a moment while giving out cards and give me a smile :) Judah getting a little help from Bryn (who is now too old to pass out Valentines) to put his Valentines cards in the little mailboxes. A friend of mine took this picture yesterday at a seminar that we went to with Bryn. I won't go into that (though it was awesome)...but this saying, "what does God say?" runs through my thoughts everyday. And it should go through yours! Every decision that I make, I try to go back to this sentence...what does God say? Because he sure does say a lot. And if you don't know...pray...get into the bible and read...go to a close person who you know has a close relationship with God and get counsel. Rather than running though this life, hit and miss...think first, "what does GOD say?" On this Thursday morning, I am just sitting here thinking about all the things the Lord has done for me...for us. He is is faithful. I was sitting with the kids the other morning and doing our bible study together and we came to a passage in Psalms 29 about how the Lord gives Strength to His people...and He will bless His people with peace. It turned into an awesome discussion about how God gives us strength...and each kid gave an example of how he gives us strength...this ranged from passing an algebra test to going to the dentist. I love how simple the Lord really is. His word is so for today...though written so long ago, everything is still for this day. So, here is my next FAVORITE THING to post. 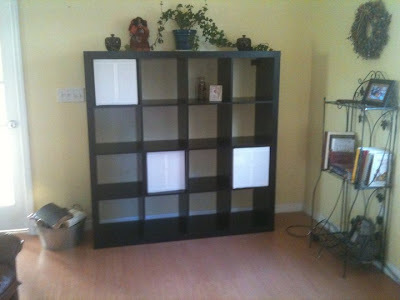 My new cubed shelving from IKEA. I have wanted these for several years...and my Valentine bought it for me for the holiday. It is a dream for any mom who has a big family. We are using the bottom shelves for the kids to put away their school books...they were so excited to organize them on their own shelf. And the rest will be for books and decorations. My next FAVORITE THING is my new bench in the mudroom. When we built our addition our plan was to have a section for the kids to hang their coats (so they aren't all over my house) and a bench for them to sit on and buckets to dump their shoes (and in the winter hats and gloves). I am so loving this. No more shoes all over the place...everything neat and organized. Just the way this mommy likes it! Here is the pathway leading up to our mudroom. It was just a dirt path, with hopes to do something different. 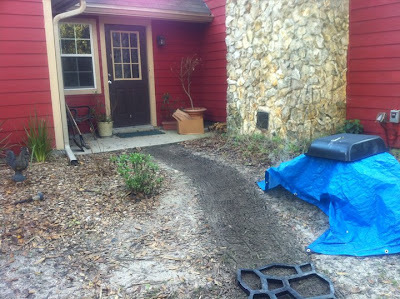 Matt had bought a mold to put a cobblestone pathway in...to make it look nice and to stop the flow of dirt into the house. And here is the pathway leading up to the mudroom after. Matt did a great job putting the cobblestone pathway in. It changes the whole look of that side in the house. Though it doesn't look as nice, because the winter has killed so many of our plants. Next we plan on putting the same pathway in leading to our front door...it will look the same, but just longer and double the width! Love that my husband is handy and will spend the time working on our house! Here is a little picture of what the kids came out to this morning on their place mat...a little treat to celebrate Valentine's Day. It has always been our tradition to have something waiting for the kids...they look forward to it every year. Jesus, the giver of love has invaded our hearts...though we try to share it every day, it's nice to have a special day to focus on it. So Happy Valentine's Day to everyone. My favorite saying this morning was Judah walking into the living room and saying, "is it Valentine's day? I was doing a quick clean over my house today, and I thought of this Favorite Thing...my Lysol wipes! Now, normally I use rags to wipe things down...I spray some cleaner on it, and voila-the perfect thing to use to clean up. But, I tried the Lysol wipes out awhile back when they were Buy One Get One Free at the local store. I only buy them then, which makes them about two dollars...not too bad for this budget. They are only used here and there...I give one to one of the kids to wipe down all the light switches and door knobs...or a quick clean up (like the bird poop that fell on the slide, and Judah refused to go down the slide)of anything. Sometimes you just need the fast and easy. They last a long time if you use them sparingly...my rags still have to be washed every week...but it helps this mom of five make life a bit easier. We were at our local art festival the other day...walking casually through the crowd, looking at all the art. We got seperated somehow and Matt walked ahead with Caleb. So, a lady came up to Caleb (who was standing right next to Matt)and said, "are you lost little boy?" Obviously from the pictures on my blog, Caleb is a different color than the rest of my family...but that's what makes us unique and the Reynolds Nation. We have funny things like this happen to us all the time. Enjoy! Found this today. What happened to Be Mine and Kiss Me? Too funny! Our mornings here at the Reynolds Nation. Sweet! I just opened up my windows in the house. The air is 72 degrees outside with a touch of humidity. Not bad for February, right? I prefer a few degrees colder and no humidity...but I am always grateful not to have the air conditioner pumping away. Update on the goats...We had Otto and Olive born to Baby (the Boer goat) on January 29th, Oscar born to Kerry on January 31st and surprise Dominic to proud mama Shirley on February 2nd. Shirley lost an unnamed little doe the day after it was born and a triplet was stillborn. 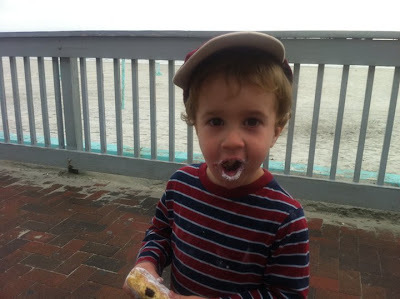 So, we are grateful for little Dominic. 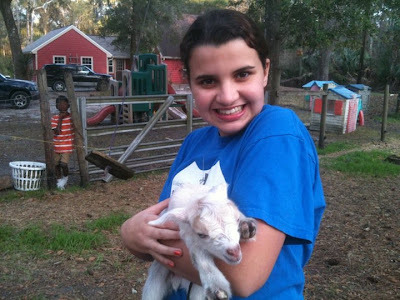 As you can see, we are very busy with our goats. The kids are bottle feeding some of them, but we have them in a pen so they can spend lots of time with them...and to protect little Dominic from the hawks (he is only 1.5 pounds). 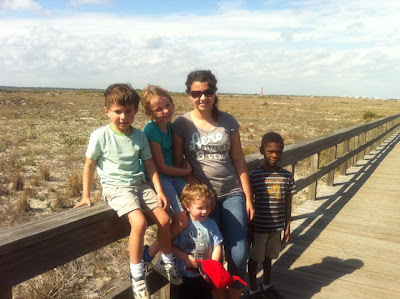 Yesterday, we took a walk along the boardwalk at the Inlet in New Smyrna Beach. 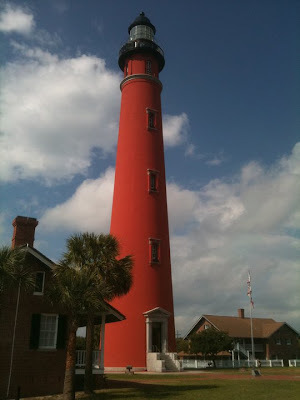 The sky was blue...the lighthouse looked beautiful in the distance...and we had a delightful time just being together. Here is an updated picture of my kids. They had a fantastic time, and so did I! I thought I would post another favorite thing item...just not my own, lol. I made this Strawberry Cake for my husband for his birthday celebration. It is his absolutely favorite thing. I inherited the recipe from my mother-in-law. The recipe was quick and easy, but looks like you spent a lot of time! Enjoy! Grease tube pan and lightly flour, beat room temp. eggs and oil. Add rest of ingredients. Bake at 350 degrees for one hour and cool completely. Beat cream cheese with milk, just till it's smooth. Gradually beat in vanilla, salt and sugar until well blended. So, today was one of those busy days. I was just sitting still for the first time today a few minutes ago, and I thought...let's blog about it. 1. Woke up at ten till six this morning...spent 1/2 an hour in prayer. Love my time with the Lord most high. 2. Took shower, dressed and went downstairs. 3. Checked facebook, e-mail, put first load of laundry in and woke house up. Checked on wee goat who was ailing last night. Within hour, goat dies and husband (who is so awesome) buries her and consoles children. 4. Make cream of wheat for breakfast...organize kids to dress, clean up rooms, make beds, stop fighting...the norm of every morning. 5. Send dear hubby off for work...supervise clean-up, wash breakfast dishes...put second load of laundry in...make sure kids shoes are on and we are outside. 6. Get new baby goats out to bottle feed with kids...two kids feed chickens, I move their pen and we then let baby goats feed off their mamas. Back inside to finish morning chores. So, what can I say about this special day? My dear husband reached the ripe-old age of thirty five. Yes, I said it...the big 35! Some may say, mid-life...or a bit too close to forty. Since I also hit this milestone in the year 2010...I know what a life-changing event it can be. It can be a time to reevaluate where you have been and where you are going. Or we can let it pass by without a thought. Came home yesterday from a staff meeting...checked outside in the pasture and saw that our new little goats (Otto and Olive) were happily frolicking in the pasture with their mother. Went inside, starting making dinner...and my husband comes home and says, " do you realize that there is another goat out in the pasture?" Our little Kerry goat gave birth yesterday afternoon to a little buck. Didn't have a clue! We had just realized two weeks ago that she was pregnant! Amazing! So we have three new goats...the kids are so excited...we have a lot of of work ahead of us, trying to handle them and get them used to us. We have one more mama waiting for delivery...will keep you updated.